Landvik is the southernmost research station in NIBIO and the only one within the nemoral vegetation zone, to which Denmark and Skåne in Sweden also belong. This gives a growing season from April to November, making it possible to grow all of the crop species that are cultivatable in Norway. Landvik has 15 ha of flat and fertile land on medium sand and loam soil with moderately high humus content dominate, which makes the site extremely suitable for field trials. Part of the trials area has been managed organically for a large number of years. These crops form an important research area for four researchers at Landvik. Research topics include growing techniques, fertilization, protein crops, utilization of waste products, plant contents and health, cold tolerant vegetables, wild crop plants, aquaponics. Part of the farmland is managed organically, and continuous trials are performed on this subject. Most of the research on Norwegian grass seed production is performed at Landvik. A wide range of research activities on amenity and sports grasses (for lawns, wildflower meadows, football fields, golf courses etc.) have been established at Landvik. The major part of this activity is connected with grass for golf courses, for which ‘NIBIO Turfgrass Research Group’ with its three researchers is the largest research group in this field in the Nordic countries. This group also provides consultancy services to the staff at football stadiums, golf courses, park authorities etc. NIBIO Landvik has an Aquaponics research facility, comprising a closed system for coproduction of freshwater fish and vegetables. This unique research facility is the only one of its kind in Europe. NIBIO’s research on this crop is performed at Landvik. Growing system trials are performed, including variety trials, fertilizer trials and pruning trials. The trial area consists of several hundred bushes. Landvik has competency for the registration, management and restauration of species-rich and threatened vegetation types in the cultural landscape. A researcher at Landvik is coordinator for following up the Environmental Directorate's Action Plan for Hay Meadows. National plant collections of old vegetable and soft fruit (berry) varieties have been established at Landvik, and these are maintained by the Norwegian Genetic Resource Centre. The collections are under continuous extension. Landvik has its own seed laboratory in which purity and germination tests are performed. The facility also houses Norway’s leading laboratory for diagnosing diseases on amenity and sports grasses. Testing of compost is a further task area at the laboratory. Landvik has competency for the development and production of specialized field trial equipment suited to various requirements, and supplies such services both within and outside NIBIO. This also includes upgrading and modification of existing equipment. NIBIO Landvik is an approved seed supplier, delivering special mixtures of indigenous grass seed originating from the Norwegian mountainous regions. Grass and herb seed for wildflower meadows is also produced, designated for revegetation in lowland areas. A special store exists for such seed. Besides smaller machines for the cleaning of seed from field trials, Landvik also has larger specialist machinery for cleaning seed lots of up to 4-5 tons, and can carry out smaller cleaning jobs for others. The weather station at Landvik has detailed weather records from 1957 to the present, and is connected to Nibio’s Agricultural Meteorological Service. The weather station is completely automated and hourly data can be obtained from the internet (link on left side of the page). There are possibilities to rent attractive meeting rooms accommodating up to 80-100 people, and with spacious and well-maintained outdoor areas. The company HØST as is Norway’s leading actor in the end-handling of organic waste for compost, and has established a separate site at Landvik with its own administration and production buildings. 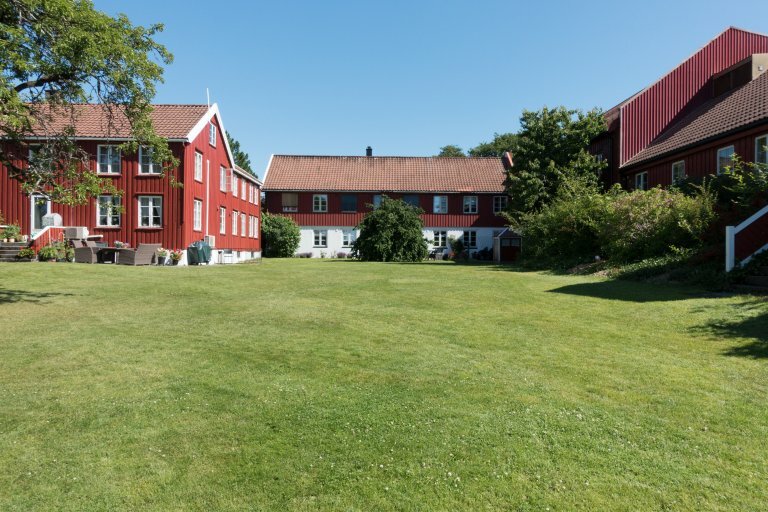 Landvik is a member of «Agder forskningsforum» which comprises research institutes throughout the region, such as NIVA, Teknova, Agderforskning, Havforskningsinstituttet, Sørlandets sjukehus og Universitetet i Agder. Concrete project cooperation with NIVA and UiA is inprogress. Further project cooperation with various commercial ventures is undertaken, financed by Norway’s Research Council, Regional Research Fund, Innovation Norway and County Government Authorities. For amenity grass, the Scandinavian Turfgrass and Environment Research Foundation is the most important cooperation partner. 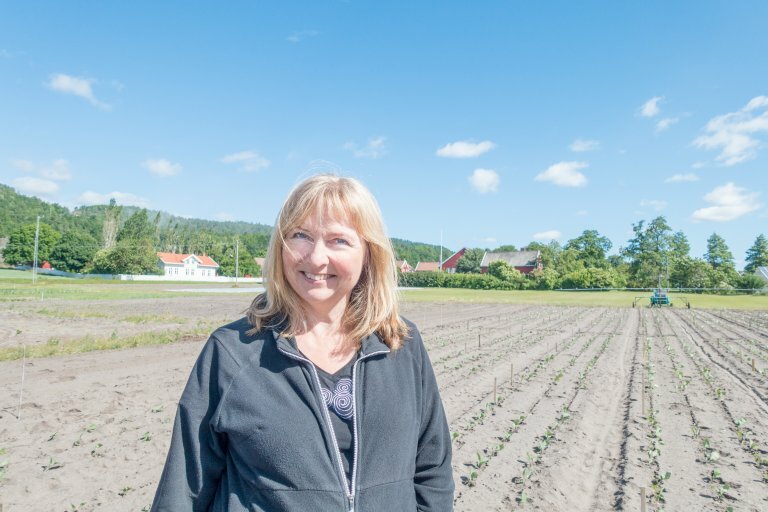 Researcher Ingunn Vågen in front of a cauliflower field. The vegetables are exposed to drought stress to investigate whether it affects taste. Photo: Anette Tjomsland. 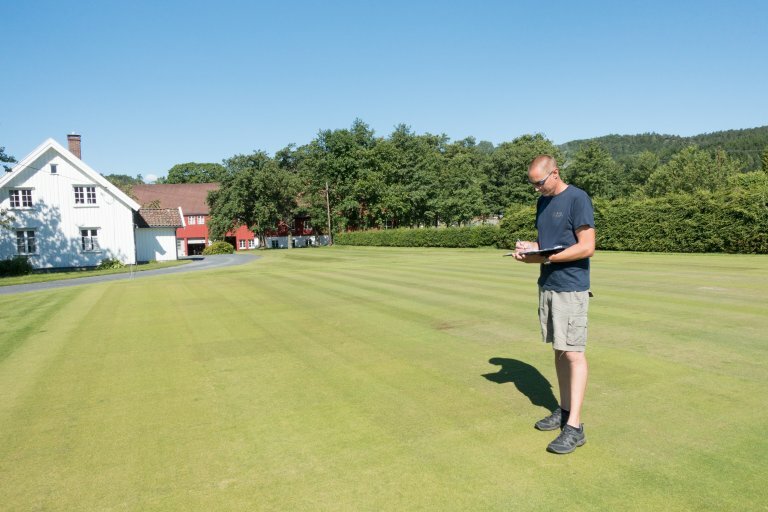 Lead research technician, Trond Olav Pettersen, registrate research data from one of the golf greens at Landvik. Photo: Anette Tjomsland. 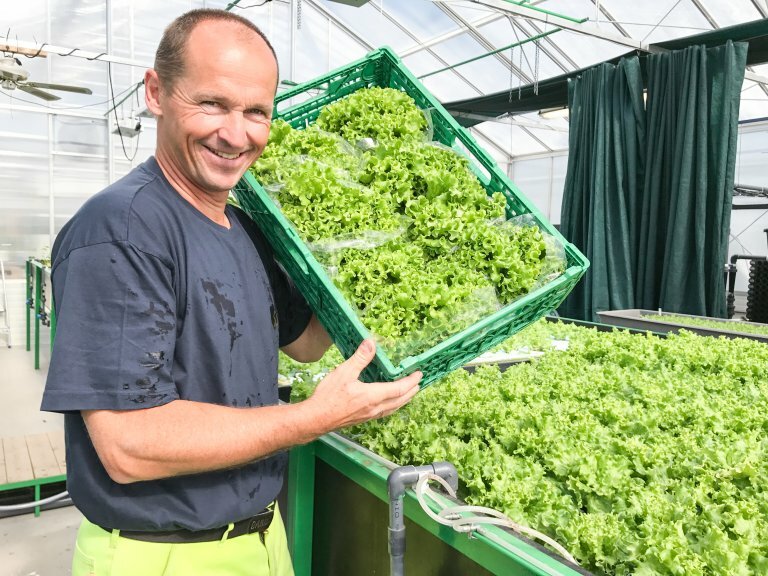 Research technician Atle Beisland with fresh salad grown in the aquaponics research facility. Photo: Anette Tjomsland. 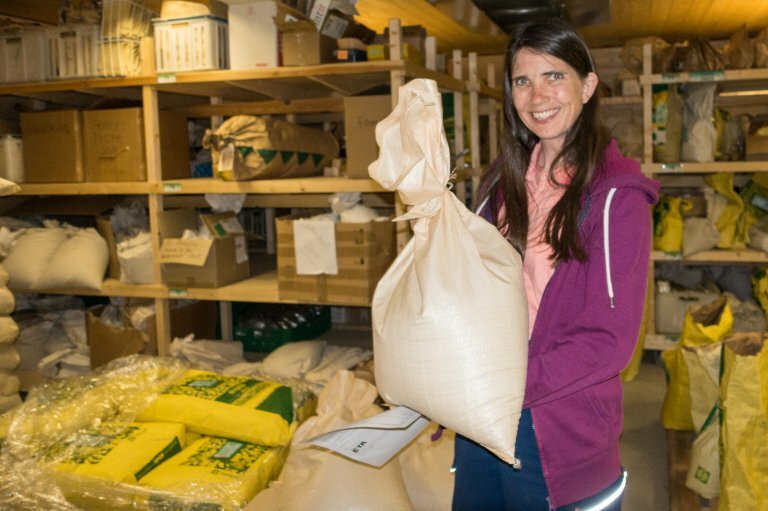 Junior Executive Officer Elise Krey Pedersen in the storage room for mountain seed. Photo: Anette Tjomsland. 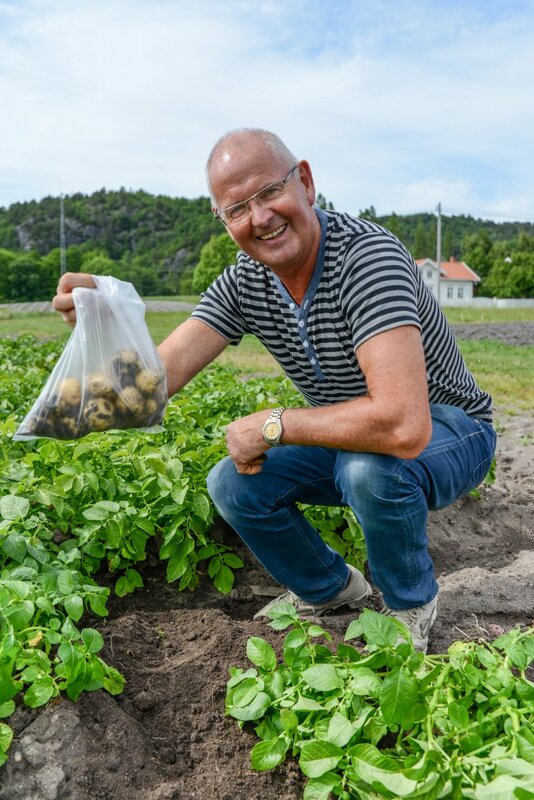 Research Station Manager Erling Stubhaug harvest potatoes in June, early in the Norwegian potato season. Photo: Anette Tjomsland.